This wasn't a fun one to write considering the circumstances. Data protection tech is great when everything is set up fresh and working properly. Everything is just fine, until it isn't and Storage Spaces failed me here. This post applies to the Windows 10 variation specifically which shares some of the same general principles with larger enterprise deployments in Server 2016/ 2019. The 3 x 3TB WD Red HDDs in my HTPC are going on 5 years old and were running fine, literally until I placed the order for new drives to replace proactively. Murphy. On the day I receive the drives, I see resiliency warnings in Spaces on one HDD and both vDisks. I also see in the System logs: "The device, \Device\Harddisk2\DR2, has a bad block." Fun. Below is the what Spaces told me which seems to lead to a pretty obvious next step right? Remove the drive labeled "Old2" from the pool then replace it. Right? WRONG. The other bit of good news I uncovered was that Windows no longer recognized my Media volume, which instead of reporting ReFS was marked RAW. At this point my M drive was basically dead and I was unable to browse in File Explorer. Here's where things go from bad to worse and in hindsight I can confidently say, DO NOT TRUST THE SPACES UI! At this stage I'm still hopeful that the repair process will remedy this. I click remove on the Old2 HDD which according to the UI, the process failed. What I didn't know yet what that this drive marked as warning by the UI was not actually the drive having problems. Even better, this drive that supposedly "failed" to be removed from the pool was actually marked as retired which triggered repair and regeneration jobs for each vDisk. The UI later caught up and flagged Old2 as "preparing for removal. So, I dutifully complied, shut the box down and added a fresh WD Red HDD. Below is the Spaces UI before I added the new drive. Something to note here, if you interrupt these repair jobs via reboots, they will start over at 0%. What I also didn't fully realize at this point was how Spaces actually behaves when you elect to voluntarily remove a drive from a pool. To see what's really going on, you have to use PowerShell, which is what I should have done from the start and ignored the UI entirely. The command Get-StorageJob will give you insight into the repair process. As you can see below I now have 4 jobs running, 2 per vDisk. What is essentially happening here is that the disk I elected to remove from the pool is being indexed of all files and slowly drained from the pool as the files it hosts are being regenerated somewhere else in the pool from the 2nd copy in the mirror. Because I have 3 disks in my pool, no single disk has a complete copy of all files in a mirror set for a particular vDisk. This disk I'm removing has 633GB of data from the Media vDisk and 197GB of data from the Docs vDisk. There also appears to be no way to stop or cancel this job once it has begun. My WD Reds are 5400RPM SATA drives, so the slowest of the slow. With 197GB marked for recovery on my first vDisk, my repair operation averaged 2GB processed per hour. Molasses. The net here is that for Spaces to recover 197GB on a 2TB mirror space took ~43 hours. Ugh. Patience is very important as this is not a speedy process. The 633GB for the Media vDisk took even longer. What complicated the recovery process was that I was removing a perfectly good drive from the pool, because the UI, leaving the problem drive having to work with bad blocks to recover data. How long would this have taken if the bad drive was removed instead of a perfectly good one? No idea. CrystalDiskInfo was useful here to shed some light on which drive was actually bad and why by reporting SMART data. There are a few interesting things happening in the image below that I want to call your attention to. First, the Spaces UI would periodically change from a Blue information banner to the red Error banner you see below flagging my M vDisk as having no resiliency. This error would clear on its own after a few minutes. Checking in PowerShell shows everything as "OK" but the disk Crystal flagged as bad has high read errors and pending sector counts. So far this jives with was is being reported in the System event log. Windows originally flagged a warning on the HDD listed on the bottom "Old2". There is no clear indication why although I have a suspicion a bit further down. Checking in Crystal, Old2 reads as good, echoed by PowerShell. Notice that Old2 is marked at "Retired" in PowerShell. The drive that actually has a problem, Old1, shows OK in the Spaces UI + PowerShell, but reporting bad blocks in the event log. Why doesn't Spaces see this drive has a problem?! The other interesting thing here is that although my new HDD, serial ending 68E3, is contributing capacity to the pool, you'll notice that no data is actually being stored on it according to the UI. This is after 8 days of data recovery!! I would have thought Spaces would make use of all storage resources in the pool when performing a repair/ regeneration activity. Apparently not! Guessing the process rebuilds using existing media then I'll have to manually run an "optimize drive usage" job to re-balance the pool when the repair is complete. Geez, wtf. As the HDD Old2 was very slowly being prepared to be removed, the % used as reported continuously dropped as the bytes were processed. While I waited and since there is no way to stop the jobs running, I dug more into the physical infrastructure of the pool. Get-PhysicalDisk will show the specifics of all physical media in the system, including the device ID. If you recall back to my System log entry, disk 2 was reporting a bad block which coincides with what Crystal is saying. Piping Get-PhysicalDisk to Get-VirtualDisk will also show some useful information as you can see what exactly each disk is doing in regards to each vDisk. I did this below for each disk respectively and you can see that the Media vDisk is flagged as Degraded on Old1. Because no single disk, has a full copy of any mirror data set, disks Old2 and Old3 are flagged as no redundancy, as at this point there is none. This output also gives a potential clue to as to why Old2 was flagged by Spaces to begin with. Why does Old2 not contribute to the Docs vDisk? Could this be the cause of the original warning? Highly suspect that this was happening at the same time Old1 is reporting a bad block in the event log. So how did it all end? In failure. Now to be fair the Docs vDisk was recovered successfully but I never lost the file system on this volume either. I was so excited, after 14+ long days I got so close to the end. .03% to be drained from Old2 but it never finished. It got into this weird loop of small 256MB and 512MB repair jobs that just didn't seem to complete, over and over. I even let it sit for a full 24 hours just to see if it would work itself out. Nope. So here I am, a Spaces recovery job that won't finish and a RAW volume that I can't browse. Luckily I have a good backup, so as much as I hate that its come to this, I'll be rebuilding and restoring from backup. If you aren't as fortunate, don't fret, you have options. I looked at a few different tools that are capable of restoring from ReFS RAW disasters. The way these tools work is that they offer a free demo build that will allow you to scan your disks to identify what exactly can be recovered. If you actually want to restore real files then you have to pay. ReclaiMe File Recovery is a tool that specifically calls out support for ReFS as well as NAS systems. There is another variant I found on Google specifically for Storage Spaces data recovery but the logos while similar are different, the docs are old and aside from a link to ReclaiMe on the page, I'm not completely sure it's the same company. File Recovery should be all you need here anyway as you are recovering whatever you can from bare drives. If you get to the point where you just need to save SOMETHING, for $79 ReclaiMe might be able to help. EaseUS Data Recovery is another option and a name you might have seen before. They boast ReFS support as well as RAW partition recovery. $70 gets you an unlimited data recovery license for a single PC. R-Studio I had never heard of before but they offer a really impressive list of capabilities and supported file/operating systems. If you search there are some people in the forums reporting using this tool and having successful recoveries. $60 gets you a R-Studio NTFS license which also supports ReFS. If your drive has bad blocks you may have data loss. If you're recovering from a 2-way mirror in Storage Spaces, one of your drives from the pool should have the files you hope to recover. First and foremost, I no longer trust ReFS. Search Google for "ReFS RAW" and look at how many people have experienced lost file systems turning RAW on their ReFS volumes. Completely unacceptable. If you value your data, stick to NTFS. The Storage Spaces UI in Windows 10 is super buggy at best and completely useless at worst. Check in PowerShell and a third-party SMART tool like Crystal to see what's really going on before taking any action. Don't believe the UI if it flags a particular drive as having problems! Always, always, ALWAYS add a new disk to you Spaces pool first, then re-balance before you elect to remove anything! Would that have saved me here? Considering that I got screwed by ReFS leaving my Media vDisk in a Raw state, I doubt it. RAID and software-defined data protection are not means to replace backups! You still need to backup your data or roll the dice with the recovery tools should a disaster strike. The same basic principles outlined here can be applied to a cabinet saw as well, but this post focuses on the portable jobsite variety. That tenet, portability, is largely why a table saw router insert makes so much sense here. 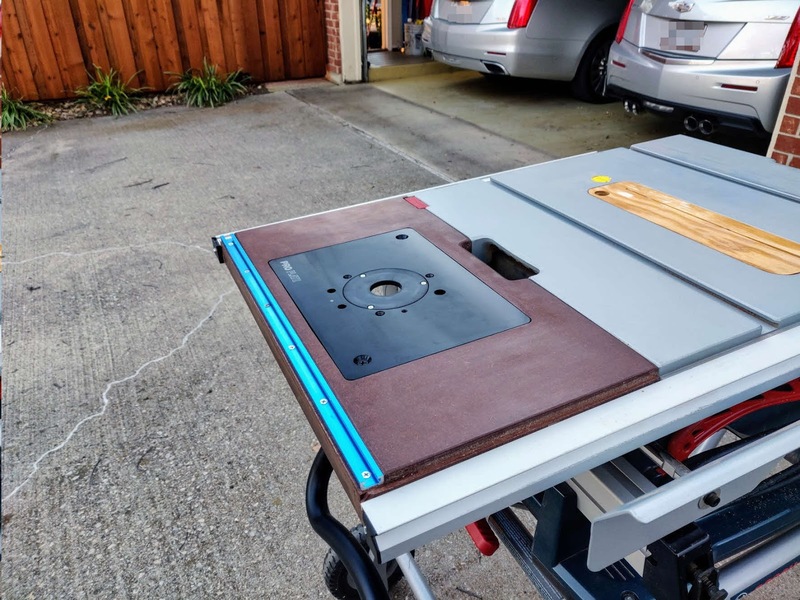 I really don’t want to take up even more precious space with a dedicated router table, plus this way I can easily move and deploy two important tool stations with one action. Ah, the life of the driveway wood worker! My table saw and router are both Bosch models which happen to be best-in-class contenders for these particular tools. Just about everything else in my tool chest is Dewalt but these Bosch models were very deliberate purchases based on overwhelmingly positive community feedback. I can personally attest, the hype is real. Why MDF you may be asking? A couple of reasons, first it's relatively cheap, it's super easy to work with having no grain pattern as it can be cut in any direction, it glues up strong very nicely without need for fasteners and lastly it's dead flat which is important for this particular use case. The image below shows the 5 parts for the fence which will attach to the stock Bosch table fence directly. Plus the triangular supports and the support plate to round out the cut list. The general idea here was to create an insert that sits between the table slide rails and a fence slightly larger than the width of the table. This is 100% custom and can be applied to any other similar jobsite saw. One quick note on working with MDF. Unless you have a stellar air filtration system you really need to wear a respirator. The MDF fiber particles are extremely fine, much like powder and will get everywhere, especially into your nose and lungs. I linked the 3M gear I use above which works incredibly well for me on all woodworking projects. The cut image for the router plate got corrupted so sorry that's missing, but you'll be able to see in later photos what I did there. The length of the piece is from table rail to rail and I made it wide enough to house the plate, a handle cutout and a T-track rail.I used 6 support pieces on the underside which I'll show a bit later. I chose the Rockler Pro Plate as its aluminum which is a strength upgrade from many of the molded phenolic you will find for sale. I read several anecdotal accounts that these molded plates will sag and warp over time due to the weight of the router. No thanks, do it right with a metal plate! Once the basic shape of the insert is cut, I created a simple template to cut the indention for the Pro Plate. Find the location on the board you want to the plate to sit, then surround with identical height scrap, hold down with double-sided tape. You want these pieces tight as possible to the edges of the plate. In hindsight using MDF around all 4 edges would have been better but what I did worked out ok. Remove the plate and insert a center square piece which will be used by the router to rest on as it completes its task. Some people leave only a very tiny lip around the edge when doing these. A bigger lip equals more strength but also you really only need enough clearance for the router and base itself. I'll explain further just ahead. Set your plunge router at the exact depth of with width of your plate and route out the lip. Once the lip has been created, remove the center square and cut out the center piece of the board with a jig saw. For the front T-track slot I used the plunge base with the Bosch Deluxe Router Guide. I HIGHLY recommend this part as a worthy addition to the tool box. The edge the guide glides on needs to be straight and true, if it isn't, your cuts will be mirrored imperfections. For this step, I marked the depth I needed for my rails on the side of the work piece, then plunged the bit real-time to the proper depth. I needed to do a little flattening of my lip to get the plate to sit perfectly flush. I really don't want to mess with leveling screws in the corners but that's ok if you want to. I found that hand scraping with a chisel was a good way to remove material. Sanding just doesn't work very well with MDF and takes way too long. Check your level by using an MDF scrap sliding from the board surface over the router plate. If the plate is too high the scrap piece will knock on the edges. Keep scraping until perfectly flush. Next I cut out the handle and pop-up notch to match the original extension wing that I removed from the table. Mark carefully, then cut out with the jig saw. I then softened the edges a bit with the rotary sander. This is similar to factory finish on the metal table edges. Moving on to the underside... Next, I drilled holes in the side support pieces that will ultimately mate up with the bars to slide into the table rails. I don't have a drill press yet so used a block of maple and walnut with a true 90 junction that I used to drill straight holes. In lieu of a proper drill press this works well. Here is a look at the underside and how I did the support pieces. 2 for each of the long runs, 1 on each end drilled for the metal bar that will slide into the table rails with a bit of overlapping between the ends and side pieces. I used no fasteners here at all, just glue and clamps which worked extremely well with Titebond 3. One thing to keep in mind here is that MDF is highly absorbent, especially on the ends, so any glue cleanup that you would normally do with a wood glue up won't work as well here. Some of the glue is going to get absorbed and won't wipe up well. I had no issues with adhesion on the ends either. You will read that some people go to careful lengths via multiple glue coats to maximize adhesion when attaching MDF end pieces. I really had no need to do that. Using my trusty router guide, I cut a clean edge on the 2 sides to match the cuts in the metal table top. Now the tricky part, lining up the bars to attach this thing to the table. With the insert in place and leveled, I slid the bars into the table rails and marked the holes from the underside for drilling. I also marked the bar length for cutting at this step which I did with my jig saw and a metal cutting blade. With the holes marked I used my "drill press" and a drop of oil for the bit to drill holes. Make sure your bits can be used to drill metal! Because I intend to attach the bar to the insert using carriage bolts, I need the holes in the bar to be square so they will sit flush. This part is rather crude but it worked. Using a cold chisel, I flared the corners on each side of the holes, then with the bar securely clamped in my vise I knocked each side flat with a 3lb hammer. The best way to do this is to line up the edge you want to remove flat just above the vise jaw. Good work out on this step. Be careful here because the cold chisel will put gouges in your vise! Ok so I'm finally done making changes to the insert piece and can start on finishing. Using a 50/50 mix of mineral spirits and oil based poly, I saturated the entire piece as much as I could using an old sock, 7 or 8 coats at least. This thinning will cause the poly to soak deep into the fibers adding strength and resiliency. After this dries a few hours I'll add several more coats then finish with a full strength coat a day later. Make sure to do some light sanding between coat sessions, 400 grit will do. If you have the Bosch 1617EVS like me and want to use the Rockler Pro Plate, one small adjustment needs to be made to the plate. One of the cool things about this router is that the static base includes a height adjustment capability, built in. No need to buy one of the expensive (but awesome) JessEm router lift kits. But, unfortunately, the Pro plate doesn't have a hole for the adjustment key, so you will need to drill one. Luckily this is aluminum which is easy as butter to work with. Here's what I did to figure out where to drill the adjustment screw hole. I inserted screws into the 3 holes of the static base that will ultimately attach to the Pro plate. I then found a random screw of similar height for the adjustment screw and inserted that into the adjustment hole. Lining up the 3 pre-drilled holes on the plate, I was able to mark where the adjustment hole needed to go. Pencil around the screw head is all that's needed here. Mark the center of the hole with an auto center punch and drill the hole using a bit of the same diameter as the height adjustment tool that came with the Bosch kit. Aluminum is so soft you don't even need to use oil to drill, but it won't hurt anything if you do. That small lone hole below is mine. Next I secured the Pro Plate to the insert using my pronged T nuts. Mark the location with the plate in the insert and drill to match the diameter of the nut. Insert from the bottom. With the plate securely in place, I screwed on the slide bars to each end of the insert. You don't want this fully tight yet, slide the insert on to the table first and square the rails. Now, tighten the bolts of the new insert to the table rails. You can see that my insert deepened in color a bit after the poly coats. I also finished the piece with a coat of paste wax at the very end. What do you think? On to the router fence, for which the pieces I already cut out. There are a lot of variations on this piece but what I wanted for sure was something adjustable that I could later add a feather board via T-track. The first step is to mock up the assembly and plan the slots that allow the front faces to slide. This needs to be done in conjunction with where you intend to place the supports, since your knobs that hold the front faces will come in contact with the supports. Find 2 spots on the front faces to drill holes, then with bolts inserted, plan how you want the slots to lay out and mark. Here I cut the slots already but hopefully you can see what I mean. Once the slots are cut and support locations planned, countersink the bolt holes of the front faces so they won't interfere with any future work pieces. Next I dealt with how to attach the custom router fence to the Bosch saw fence. Unfortunately the side slot on the Bosch fence is not a standard T track slot and I couldn't be bothered to run to the blue/orange store, so I cut two of my T track bolts down to size. Dremel + cut off wheel to the rescue. With the head squared a bit I was able to fit into the side slot. From here you just need to decide where to punch the holes in the MDF piece that will sit adjacent. I centered my piece and marked for holes near the quarter-mid of each side. 2 bolts is good enough for this. Due to the height of the slot in the Bosch fence in relation to the table, I really had no choice but to cut a notch to clear the adjustment knobs. I got the smallest I could find so to limit the depth of the notch I'd have to cut. A few bangs of the chisel and presto. With slots cut and holes drilled I felt good enough for another glue up. Both of the vertical pieces sit on top of the bottom piece which will ultimately sit flat on the saw table. You can also see how I marked the holes to center the bolts from the Bosch fence to my rear piece. While I glued on the fence face T-track carrier (upper portion of front fence face) I measured and cut supports. I wanted the triangular parts of these as flat as possible for the middle supports just in case I ever want to add a dust collection port. With the supports cut, time for more glue, more clamps. I let the glue harden overnight then moved on to another 50/50 poly/mineral spirits soaking. I honestly lost count of how many coats I did, I just kept soaking until my mix was gone, hitting the exposed edges especially hard. I let this cure overnight again then did one last pure strength poly coat following a light sanding. After one last overnight curing I bolted on the front faces and screwed on the upper T-track. Here's a look at the "knob chamber" so you can see each in relation to the slots and the supports. It's a little tight but plenty of room to move things around without collision. There you have it! The project before the "project". Let me know what you think or if I can answer any questions. Thanks for stopping by! Say hello to what will very likely be the Server Manager replacement in Windows Server 2019: Windows Admin Center (WAC). Formerly Project Honolulu, WAC has officially gone GA with build 1804. Microsoft clearly has big plans for this tool which has the potential to replace everything and anything currently based on the well aged Microsoft Management Console (MMC). It will probably be the release that follows Server 2019 before we see any possible real deprecation of MMC. Because WAC is a web service that manages individual servers, it must be installed on every node you intend to manage, for Server 2016/ 2012R2. Installation is a pain-free affair requiring only permission to modify a particular server’s trusted hosts settings, a designated web port for management and either a 60-day self-signed or other generated SSL cert. If managing a cluster or larger environment, whichever node you intend to use as a gateway for management access must have visibility to all other nodes in the cluster or environment. Here I’m using S2D1 as my gateway and have manually added all relevant hosts and cluster objects. You can optionally use any Server 2016 or Win10 PC as a gateway to provide management access to all other servers in your environment. From what I can tell, the only thing that truly designates a node as a “gateway” is by adding other objects to it, per below. The designated gateway itself can then authenticate assigned users or administrators based on local or Azure AD. Upon installation, WAC will enable a few additional solutions depending on the features installed on your server. For my scenario WAC provided 4 distinct management panes: Server Manager, Computer Mgmt, Failover Cluster Manager and a brand new Hyper-Converged Cluster Manager. Additional modules and configuration pages will be installable as extensions within WAC. All of the configuration pages in the sections that follow are essentially extensions so the extensibility of this tool is really only limited by the extensions available. Read: this tool has been designed for big things! A notable change possibly coming here is that Computer Management will be for Win10 PCs only at some point. Right now you can use Server or Computer Management on servers, as neither tool is capable of completely replacing the other. “Computer” in this context will soon mean “PC”. This is where the majority of new functionality exists currently. To a large extent, this is a combination of the legacy Server Manager tool with a few of the MMC-based tools and a nice coat of webby modern polish. Not all functionality is present here and for many things you will still need to access the MMC tool counterpart. A lot the items available are self explanatory but I’ll showcase a few of the interesting additions below. Real-time system performance charts are visible on the Overview page with an option to enable disk metrics separately. The warning that follows suggests that these metrics consume a great deal of overhead so to only use when you must and then disable when you are finished. Notice that only my C drive is visible here, no Cluster Shared Volumes in use by S2D running on this same host. This appears to be a Server 2019 feature only. Some areas are surprisingly good with new concise takes on existing models, such as the Firewall configuration. I can very simply see all incoming/ outgoing rules and easily create a new rule without having to use a series of wizard-driven questionnaires or multi-tab MMC dialogs. This is a fantastic example of what this tool should endeavor to change in future versions of Windows. If more granular manipulation is required, the settings dialog of any rule can be accessed to change things further. A largely-functional network management stack is a welcomed addition here, no longer requiring ncpa.cpl to alter IP or DNS settings. Another nice addition here is a fully functional and integrated Shell window. I can do whatever I need to within PowerShell right from WAC. The registry editor makes an appearance here, no longer requiring regedit.exe to make any needed changes. The Remote Desktop page provides an embedded frame for direct RDP connection to the server you are connected to. No need to launch a separate RDP client. WAC shows me this same SQL update but a slew of others too, including Intel hardware driver updates. Awesome! Hyper-V can be managed from WAC as well providing useful event and resource usage data including the ability to manipulate the VMs directly. One thing I don’t like about the current toolset is that when attempting to connect to a VM I am greeted with a popup to save a .rdp file, no direct/ protocol-less console. Hopefully this will get better. Virtual Machine Inventory shows a summary view of all VMs on this particular host along with real-time resource utilization and clustered status. Important to note that VMs running as clustered on other nodes are not shown here. The new VM dialog is simple and consolidated enabling quick deployment via minimal hoop jumping. The full VM settings dialog is also available here for granular settings changes. This may actually be good enough to almost completely deprecate Hyper-V Manager for day-to-day use. Awesome! To fully manage S2D clusters with Admin Center you need to be running a preview build of Server 2019, which I don’t have yet. Even though the error dialog below says an April patch is required for Server 2016, per this article, that’s not accurate. This gives a sense of the things the UI will let you do here however. 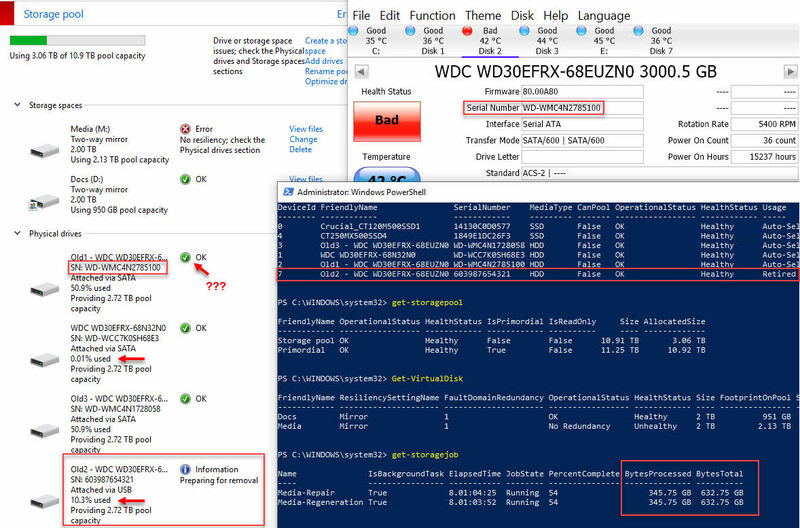 It’s unclear if Admin Center will facilitate S2D setup or not, or if PowerShell will still be required for this in Server 2019. While Hyper-Converged Cluster Manager does not work for Server 2016, Failover Cluster Manager does, to some extent. If you have a S2D cluster some of this will not work, namely the details section on the Disks page. Anything touching S2D directly will likely fail and as a result may require a restart of the WAC service if the UI becomes unresponsive. The dashboard page shows general status of the clustered components including options to start, stop, remove and simulate failures. Many of the page tabs are fairly basic at the moment, so WAC doesn’t yet replace any MMC counterpart for full functionality. Similar to the Virtual Machine page in the new Server Manager, the dialog here should be familiar although now we see which host server is running a particular VM in a clustered state. There is still this split brain problem in Hyper-V clusters where VMs are ‘optionally’ clustered or left local if you want. If you are running a cluster your VMs should be part of the cluster, storage resiliency is only possible if the VM lives on clustered storage. In the split brain model I now have 2 classifications of VMs, clustered or not and still require 2 distinct tools to manage each: Failover Cluster Manager for clustered VMs, Server Manager for non clustered VMs. I doubt this will change any time soon. No love for IE. I got this somewhat hilarious error suggesting that I install Chrome or Edge to use Admin Center on the server itself, considering Server 2016 ships with IE only by default. Most will manage remotely but it would sure be nice to be able to do SOMETHING locally if I needed to without having to install another browser! Just another nail in the coffin. RIP IE. The need to re-authenticate is definitely excessive, over and over and over again. Every piece part that you connect to, even sub-elements on particular pages sometimes prompted additional challenges for authentication. Even after entering explicitly defined admin credentials for “all connections” I was still prompted continuously to authenticate. In a large environment I would be tearing my hair out. This must be resolved! Watch this space, managing Windows Server is about to change in a big way!